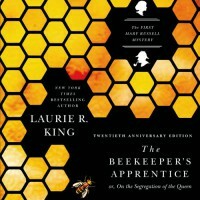 The Beekeeper's Apprentice (Mary Russell and Sherlock Holmes # 1) [Audible Version] - This just makes the book better! Please check out my review of the book itself here. I have read this book more times then I care to count. I have listened to it at least twice before this. However, the library that had the CASSETTE TAPES of this is several moves away and so I purchased this copy with my new Audible account as I've longed to listen to it again. That it also fits three of this year's challenges is an added bonus! While nothing beats a physical book in your hands, there are some that I love to listen to as much as read. The reasons for this are different for each book but for one; the narrator. 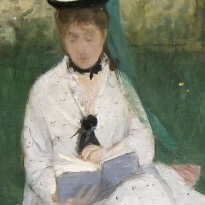 The reader, performer, or narrator (depending on the book) has to bring something that I simply can't get from the text. Often the ones I like the most are the ones that change my view of a character by how they present them. Jenny Sterlin, the performer for this series, gives perfect voice to so many of the characters King brings to life. Her voice for Holmes fits perfectly how Russell describes it in the chapter, and her voice for Russell is almost precisely what I had heard since I first read the book. Each character gets an unique voice, with the proper accent to go along with them. One of the best is the Police Officer in Wales; she captures the lyrical accent perfectly. "Russell, if you decide to take up Grand Prix racing, do ask Watson to do your navigating. This is just his métier." "Why, Holmes, do you have doubts about my driving?" "No, Russell, I freely admit that when it comes to your driving abilities, I have no doubts whatsoever. The doubts I have are concerned with the other end of our journey. The question of our arrival, for one thing." "And what we shall find when we get there?" "That too, but it is perhaps not of such immediate concern. Russell, did you see that tree back there?" "Yes, a fine old oak, wasn't it?" "I hope it still is," he muttered. Now imagine that in a "high, biting voice" for Holmes and an almost sarcastic, blasé, lower female voice for Russell and you have an inkling of how funny this section is. I wish I could share the audio. While I might not recommend this for the first read through, I do highly recommend you track down a copy of this book in audio version if you desire a re-read. It's one of the better audiobooks out there, in my opinion. 2014 2014 Audiobook Challenge 2014 Reading Challenges Audio Books Awesome Heroines Historical Fiction Mary Russell Challenge Mystery Read It Again Sam 2014 Challenge Reread Sherlock Holmes Pastiches The Shelf of Awesomeness!